Shares in construction firm Galliford Try fell 20% at the start of trading after the firm issued a profit warning. The company, whose activities include housebuilding and road bypasses, said profits will be £30-40m lower than the expected £156m, as it plans to shrink the size of its construction business. 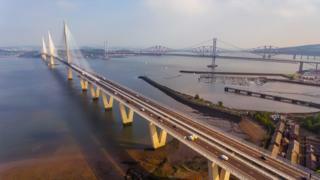 It said the biggest chunk related to the Queensferry Crossing, which recently raised final cost estimates. It says it plans to concentrate on areas where it has a successful record. The group was hit last year after one of its partners on the Aberdeen bypass, outsourcing giant Carillion, collapsed, leaving it with extra costs of £38m. It has continued work on that much-delayed and over-budget road scheme with its other partner, Balfour Beatty. Galliford said that cost was not being revised. It said its review would assess both the progress and contract positions throughout the rest of Galliford's construction business. But it added that the majority of its construction businesses "continued to perform well". The firm recently promoted its former finance director, Graham Prothero, to chief executive. The company said it would have its verdict ready in the next few weeks and would "share the detail of the review", along with a further update on group trading, in its scheduled statement on 21 May.